Income Distribution Does Matter. It’s Wrong Now and Stopping Growth. When people think about “income distribution” there’s a tendency to think of it only in terms of what different people or households have available to spend. In other words, we focus on the fairness or equity of whether some households should only have a small amount of money to live off of vs. others who get a large amount of money to live off of. The debates then often deteriorate into whether or not the households put forth effort (“worked”) for their income and therefore “earned” it. But there’s more to the issue of income distribution. A household’s income is not just determined by how much “effort” it’s willing to make or how much “investment” it’s made in the past. So a household’s income isn’t just how much you work and what education/qualifications you have. The general level of wages matters too. And that’s determined at the macro level by institutional arrangements in society. The nature of production is that it requires both capital and labor. The joint product is then sold. This is called productivity. Part of the income distribution question is “how is the value from joint productivity split up between payments to capital and payments to workers”. In the U.S. during the Golden Era, the period of World War II until the mid-1970’s, the social contract and institutional arrangements were that the benefits of increased productivity were split evenly between both capital and labor. Both benefitted. Starting around 1980 that deal was cancelled. The social contract has increasingly moved to all gains from improved productivity going to capital and none to labor. As a result, labor’s share of national income has consistently declined. The Great Recession was a major blow. It’s this change in the social contract that is the root source of the frustration and pain felt by so many households. Who cares about double-dip. We never left. Why? because you can’t get out of a recession without consumers/labor income growth. While productivity has grown over the last few years, labor’s share of national income continues to plummet. This implies that others (capitalists / profit-makers) are ‘out of their recession’ but consumers and laborers are not. The BLS has a nice publication here. 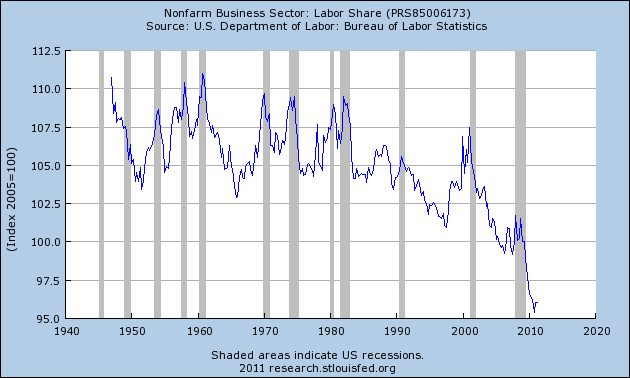 Ordinarily a low cyclical labor share isn’t necessarily a problem because firms can use profits to invest in new business ventures a eventually lower the unemployment rate and provide more compensation in a recovery. The problem here of course is that firms are too busy paying off past debts from poor decisions made a decade ago, or two skittish to do anything substantial with their profits at the moment. So that, in combination with the low labor share of income is like a double-whammy for consumers and laborers who see the haves continue to have and the have-nots continuing to have nothing. ← It’s the Political Economy That Must Change. You make a compelling argument for how income distribution being has been divested between capital and labor… to much has gone to capital and not enough to labor. The super-rich and businesses are sucking off to much capital and both are part of the problem. However, by taking well over 20% of GDP, government itself is a third wheel further widening the problem. Therefore government is part of the income distribution problem. Its taking to much capital without giving enough back to labor. How do you think we are going to adjust government in order to help fix its causative effect within the income distribution problem? Azleader is not quite right in his comment above. The Government doesn’t take capital, Government is an instrument of the distribution of capital. While (some) of the very wealthy keeps most of its wealth (especially rapidly acquired wealth, such as tax cuts) in investments or capital or reserves, the government spends most of what it takes in (actually more than it takes in as we have been reminded so graphically this past spring). Government takes in money in taxes and then spends it on roads, military, universities, medicare, medicaid, social security, SSI, food stamps, WIC, EITC, police, fire departments, schools, etc. And the people who receive it, by and large, spend it, which flushes it through the economy and actually contributes to the growth of the economy. Even the hated, nameless, “bureaucrat” supports a family and buys groceries and keeps local merchants in business. So, while we may not enjoy supporting poor families and keeping their children from going to bed hungry, it actually helps the income distribution problem about which you are speaking.